The other post title possibility: The Dye-a-phragm. Of all Pat Dye’s loveable idiosyncrasies, The Cough may be his most endearing. And enduring. How do you do a Pat Dye impression? To this day? You cough. It’s not mocking—Dye knew about the cough. He knew you knew about it. 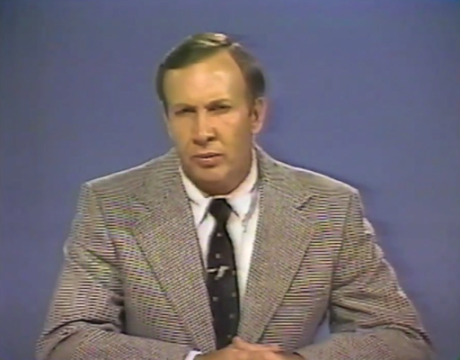 Everyone who settled into their recliner for the Auburn Football Review from 1981 to 1992 knew about the cough, remembers the cough. “I know our fans will be glad for me to quit coughing on our show,” Dye told AFR host Phil Snow during the last episode of the 1982 regular season. Snow laughed. Because the cough, and the telltale microphone muffling that actually made it twice as noticeable, were great. You looked forward to the cough. You did cough counts. On the aforementioned episode, the ol’ Dye-a-phragm logged 12 coughs, or rather 12 coughing episodes. That’s a lot. As a kid whose first exposure, as it were, to Ahem Corner, as it were, came in the mid 80s, I was surprised to see how pronounced it was, at least in terms of frequency, after just two years on the Plains. But if there was a game to get choked up after, the ’82 Iron Bowl was it, I guess. So for those too young to remember, and those who love the man too much to want to forget—even my grandfather who hated the cough loved the cough—here’s a heart-warming, hilarious hack-hack flashback to what it was like to be an Auburn fan on Sunday afternoons throughout Dye’s glorious tubercular tenure. Related: Pat Dye belly dances into 1990. I blame the dusty Auburn Football Review studio. For shame.